I see a lot of growing buzz around podcasts and podcasting in general. It’s kind of interesting and yet weird seeing as I’m a self-proclaimed audio freak and have been listening to podcasts and audiobooks for years. Being an early adopter feels slightly rewarding in a sense that podcasts, this relatively unknown thing I’ve been consuming for quite some time, are coming into their own, and deservedly so. But podcasts are far from a “thing” or a fad that’s taken the Internet by storm. There’s a rock-solid foundation for their success that makes perfect sense on the largest of scales, and one that marketers can effectively leverage. Oh boy, do I have a lot of revelations for you. Let’s start with the background of podcasts. If you haven’t noticed, we are living in an audio era. Audio content has quietly become an indispensable part of the way we interact and consume content, particularly among young(er) demographic that comprises the bulk of the listenership. 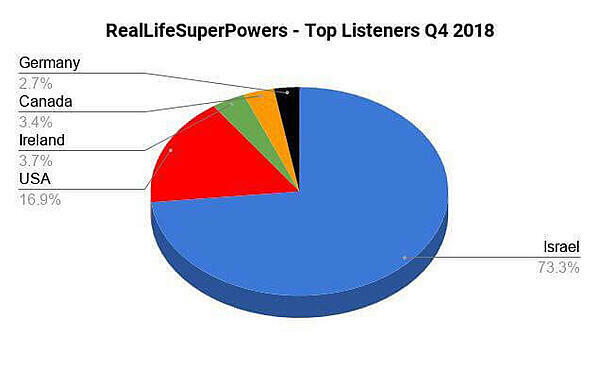 I’ve been experimenting and pushing my own Real Life Superpowers podcast. Besides being a passion project of mine, I find it’s the most direct channel for aspiring entrepreneurs and leaders to consume content. (the goal of my podcast is to help listeners get inspired, and uncover and tap into their unique capabilities - real-life superpowers, if you will). And you know what? It constantly amazes me just how big podcasts are. For the past few months, I’ve been closely working with Trinity Audio, a contech (content technology) startup that’s helping publishers leverage voice tech and audio by turning readers into listeners. I get to hear all kinds of crazy numbers. For instance, did you know that the podcast audience doubled in between 2014 and 2018 in the US? Almost 200 million (!) 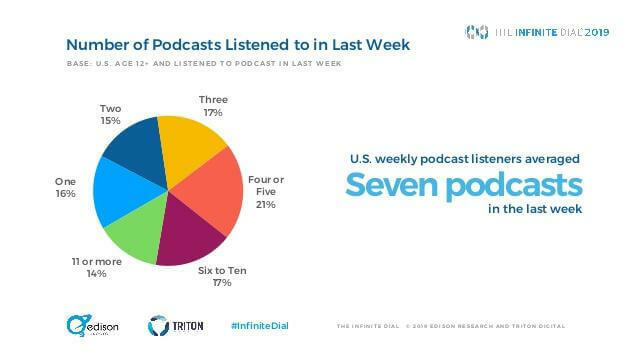 Americans are familiar with podcasting, out of which 90 million are monthly listeners, according to 2019 Infinite Dial Study by Edison Research and Triton Digital. I guess it shouldn’t surprise me that they’re my largest international audience as well. I’m often asked why podcasts particularly? What makes them so enticing? As a marketer, how can you leverage podcasts? It’s not like they’re the first association with marketing like content marketing or social media marketing are. 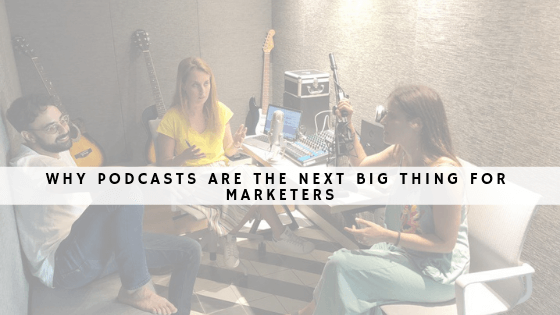 There are quite a few ways podcasts that can help your marketing strategy, beginning with understanding the “schematics”. First off, podcasts are an easily digestible media form in various shapes and sizes, which plays a major role in why they are one of the fastest growing digital formats. The average podcast last about 45 minutes (I try to keep mine around that mark, a few minutes more or less) and about 85% of people who listen to podcasts listen all the way through, according to Edison Research. So, there’s an opportunity to build up your recognition and give your brand a voice (pun intended). Arguably the most important fact is that podcasts help facilitate one key aspect of modern user behavior: multitasking. It’s really easy to multitask while listening to an episode, and in a way, it’s a habit in the making. On average, US podcast listeners listen to seven podcasts per week. That addiction-like focus makes podcasts ideal for on-demand, content binge consumption that poured over from other digital media (i.e. ‘Netflix and chill’). They’re the perfect medium for a customized and highly personal connection with your target audience which has its own terms: listening to what it wants when it wants. With the growing audience, there’s more incentive to create quality content and jump in with your own show. Let’s face it - if there’s anything we marketing professionals know how to “sell”, it’s content. There’s always some valuable information to share. It’s true that podcasts are young and fairly basic in terms of what they can offer to advertisers. However, you need to keep in mind that an average podcast ad is 90 seconds (longer than traditional ads) but ad revenue is rising. 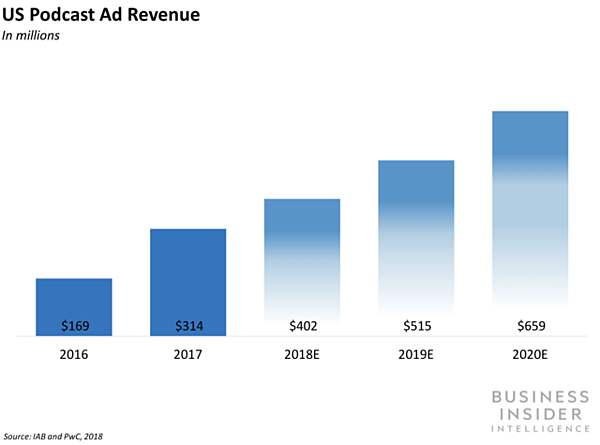 The medium presents a fast-growing ad opportunity: advertising rose 86% YoY in 2017 to $315 million, per IAB. The research predicts even stronger returns in the years ahead, forecasting that podcast revenue will surge to $659 million by 2020. Hence, it’s safe to assume podcasts will yield a favorable ROI, which in turn will give advertisers more confidence to invest in the medium. Podcasting shows significant year-over-year growth and one huge “area” where a lot of listening happens is the daily commute. In the coming years, podcasts are likely to become primary audio sources in the car (they are already slowly displacing mobile phones, not to mention CDs) due to the built-in Internet connectivity and "infotainment" systems that will facilitate easier Internet-based car audio. Apps on devices will also make podcast listening easier and quicker to access, while some even predict certain smartphones will have a dedicated podcast button. And let’s not forget the voice AI expansion where Alexa, Google Assistant, and other voice-based virtual assistants will make accessing podcasts easier and more mainstream, whether it’s via a smart speaker, a smartwatch, or another smart device. For marketers that are still on the sidelines, podcasting is worth a try. As we’re accustomed to, the content is king and the importance of adding value to your audience and engaging it. For that matter with podcasting you have a real winner on your hands.